The idea was that I'd rent a bike and take to Bilbao on wheels. Now instead, I'm in the pub this Sunday afternoon. But back up. To the bicycle. Turned out that the two local places to rent don't open today, even the one that was supposed to. 'Sorry for the inconvenience', or words in Basque and Spanish to that effect on the door. So instead I took a tram across the city, and before getting here I've done the culture thing, and been to two museums. It's my first time in Bilbao, though not in this part of Spain. And already, despite arriving in very dull and rainy weather after a delayed flight last night, I'm smitten with the place. It's got culture, architecture, a maritime history that has spanned the globe, wonderful river promenades, lots of people with big smiles and ready to burst into song in the pub at the drop of an A Major. Which is probably why they don't need TVs. I'm in the old city just now. But a 10-minute tram ride this morning took me to the Maritime Museum to start my history and culture indoctrination. It's typical of how well the Bilbao tourist business does its thing that the museums are open on Sundays. (And in fairness, so normally is the bicycle rent shop.) 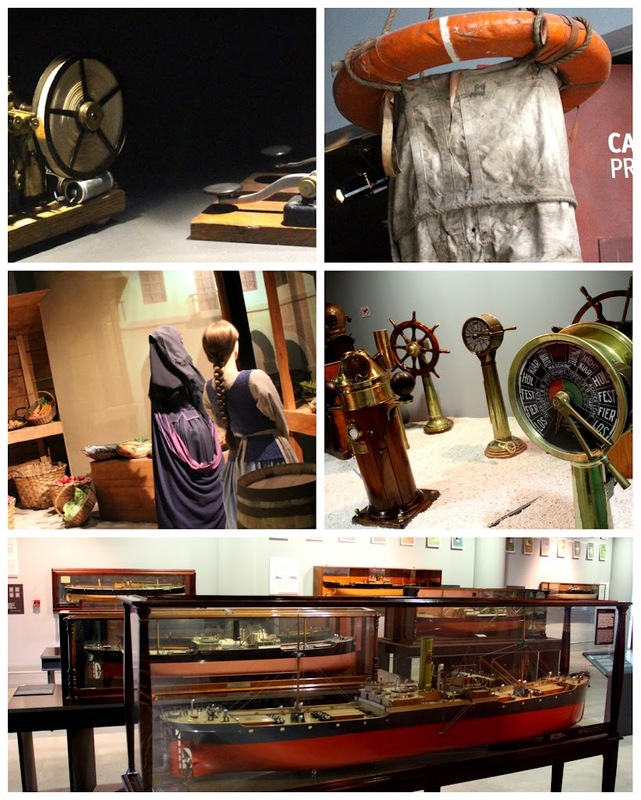 The Maritime Museum offers a jaunt through Bilbao's seafaring and maritime industrial history through video, artefacts, navigational equipment, recreations and models. It has a shipwreck rescue history too, being where it lies just in from the Bay of Biscay, and if you never knew just what a hotshot lifesaving invention the breeches buoy was before there were helicopter winches, there's one here. It's scary, but I'd take my chances when there were no others. That done, and done well, it was off to the big one, a ten-minute walk further along the river. The Guggenheim Bilbao. Not just the cultural piece de resistance in a city of a lot of culture, but also an architectural one. To which we in Dublin have a link. Because the architect was Frank Gehry, also the architect of Dublin's landmark Conference Centre. 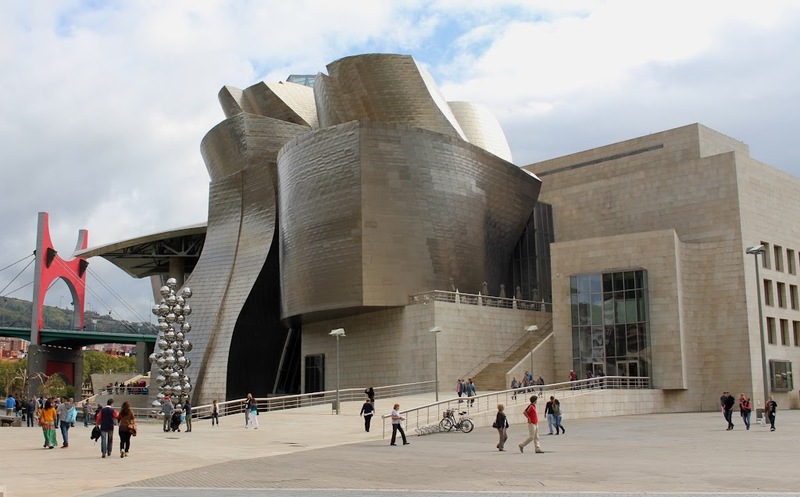 His Bilbao creation was opened in 1997, fully funded by the Basque authorities here, and operated by the Guggenheim Foundation. As a piece of art in itself, the building is a blast. Wild metal and stone shapes outside, sweeping lofty interiors, a sculpture piece in architecture. But then, there are many artists who trained first as architects, and who feel there's little difference between the two. 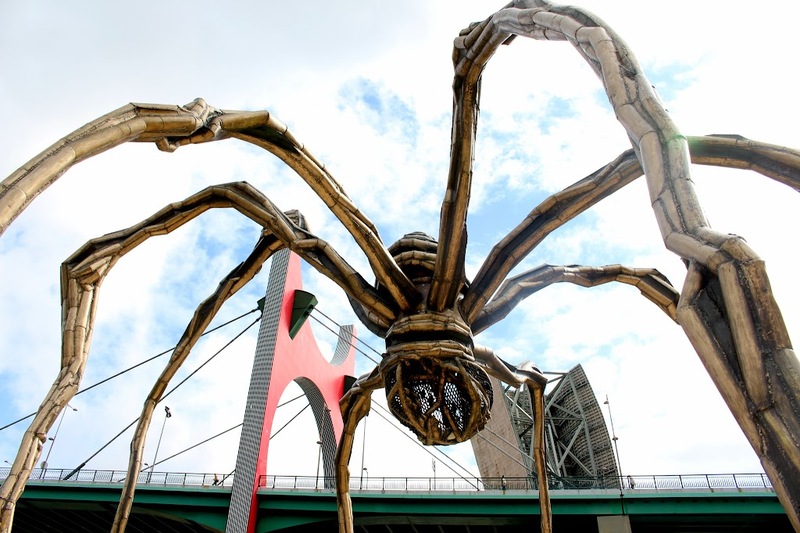 Guggenheim Bilbao has a mix of permanent and moving exhibitions, including a regularly changing selection of the great art that's part of the Guggenheim Foundation's extraordinary and very eclectic collection. In the permanent art, just after the entrance there's a whole wing devoted to an installation in steel (above) by the artist Richard Serra. Entitled 'A Matter of Time', it's a series of massive steel whirls and swirls, which don't appear particularly interesting. Until you go inside them. Then there's a hit. Some just have an entrance and then you're inside, others wind round and round in narrow passages until you eventually reach the centre. Because the walls of each piece keep changing attitude and tilt, it's dizzying, and like all those science fiction writings and cinematic depictions of time travel, you wonder how and where it will end. Maybe it's even what we don't remember, travelling out of the womb, or what we don't know yet, travelling to whatever is beyond the moment of death. Whatever, it's certainlty more than it seems at first sight. 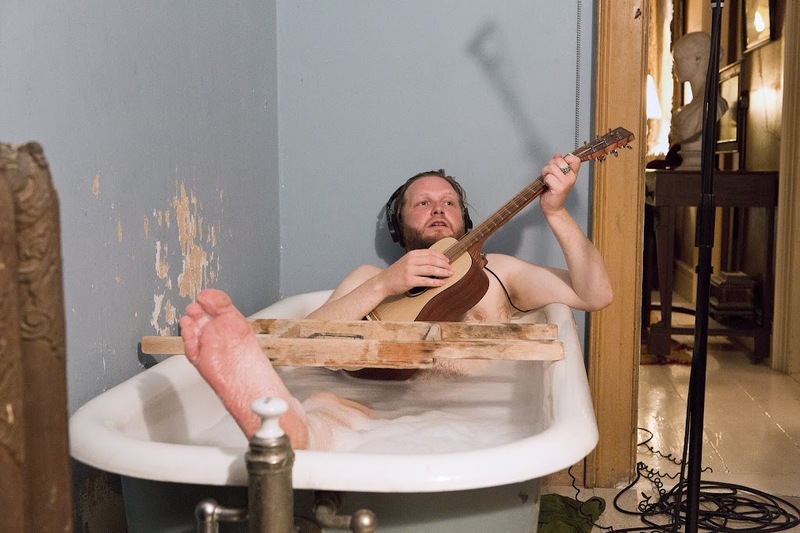 From Ragna Kjartansson's 'The Visitors'. Picture courtesy Guggenheim Bilbao Museoa. Next on the same floor is a video installation of a performance by the Icelandic artist Ragna Kjartansson, with nine screens, each showing one of the performers playing or singing in different rooms simultaneously. The music is based on Abba, the title 'The Visitors' taken from the last Abba album. Again, it's how it hits you, you can see four or five screens at a time, the individual performer's music coming from his or her's own screen, merging and mixing in different strengths depending on where you are in the room. It's also worth watching the reactions of those who come in. Some sit against a wall, heads bowed, lost in the music. Others gaze around, their faces as myriad in expression as there are musical notes in the piece. One woman watches curiously to see if the water protecting the modesty of the guy playing a guitar in the bathtub will swish revealingly as he shifts to finger a new chord? Art, but not as we have known it, perhaps. There's an exhibition being put in place on the second floor at the moment, but the third floor has a number of rooms with contemporary modern art. One is devoted to three pieces by Robert Morris, including a set of five baulks of timber placed partly on each other in the same plane, the bottom one holding it all together. Another is a square of 16 steel open-ended cubes, neatly cut and bolted together. The third is a trampoline in the shape and size of a boxing ring. I'm not sure whether there's supposed to be an overall effect, but it didn't really have one on me. 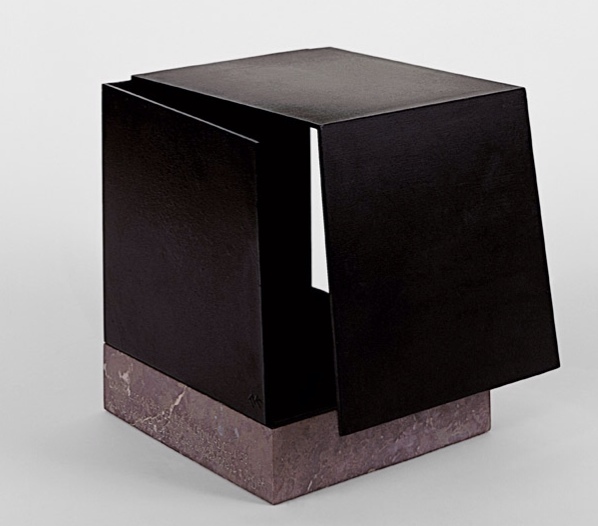 Jorge Oteiza's 'Metaphysical Box by Conjunction of Two Trihedrons'. Homage to Leonardo, 1958; picture courtesy Guggenheim Bilbao Museoa. A space devoted to Jorge Oteiza, (1908-2003) is a set of small sculptures in steel, a couple of them cuboid, others with a sense of movement in circular swirling shapes. Described as a homage to Leonardo, they remind me in a way of the models of Leonardo da Vinci's inventions at his last home in France, which I visited a few years ago. Again, if you look at them from an angle that allows you to see them all at once, they create an overall impact far beyond their size and individuality. Oteiza is considered one of the most important Basque artists of the 20th century, though he exhibited very little outside his own area. 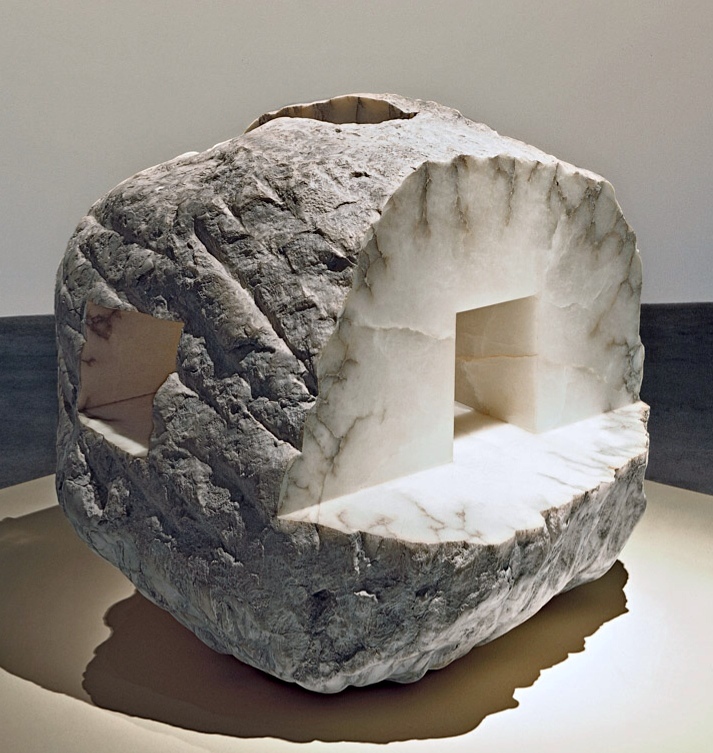 Eduardo Chillida's 'How Profound Is the Air', 1996, Alabaster; picture courtesy Guggenheim Bilbao Museoa. Eduardo Chillide was a trained architect from the Basque country who went to Paris and became an artist in painting and sculpture. He returned to Spain in the 1950s and at the end of his life he had concentrated on iron, wood and steel and concepts of space. His exhibits here at the moment are in pink granite, 'Space for the Spirit', alabaster, 'How Profound is the Air? ', and a couple of pieces in steel that tower upwards, looking like a search for spirituality with extablished religion themes in gothic style. And so, after all that, it was time for lunch and the old city. Which is where we came in. As I finish this, in the Xukela pub, established in 1982, a lot of the locals have now departed, for their siesta, one presumes. The tourists — there are still some even in early October, like this writer — are taking up some of their places. 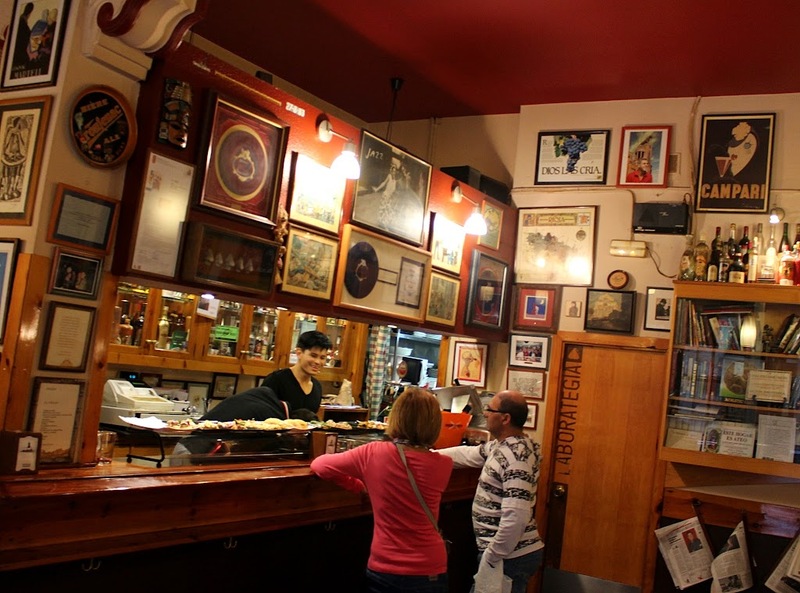 Intrigued, as I am, by the decor of this simple place, the walls covered in old posters, paintings and photographs. A collection of beer mugs from all over the world. Drinks too from the strangest of places, not for drinking, but displayed as their own form of cultural and museum exhibits. It's the kind of pub that my father would have liked to run if he lived here, I think. But of course, it's the same kind of pub that he did run as the Hideout of the 50s through the 70s particularly, and which my late brother Des did subsequently. It's the kind of pub that attracts me, for some reason, no matter where I might find it.